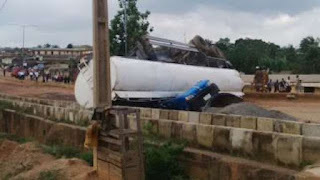 A petrol-laden truck fell and crushed a commercial bus called 'Korope' at Asubiaro area, Osogbo. It happened close to a church. The tanker spilt its contents but thankfully no life was lost. As at 3:30 - 4PM, Police and Civil Defence were able to seal up the area, as the contents of the tank which were still spilling onto the ground were being transferred in black water tanks. Residents have urged the government to fix the road since it is rapidly deteriorating and accident are always re-occurring.